The 240p Compatibility Problem - In which we discuss the issue at great length. The 240p Compatibility List - In which we present our findings for TVs, Capture Cards, and Video Processors. The 240p Compatibility Test - In which we show you how to test your own equipment for compatibility. We will try to explain this esoteric topic as clearly as possible. Throughout the following page, we assume we're dealing with North American or Japanese signalling (NTSC), but when dealing with PAL content the numbers are the only things that really change. Older video games and computer systems output video signals that don't completely conform to normal video timing standards. Back in the day, this was not a problem because the video signals directly drove the CRT in your television. CRT televisions were designed for interlaced content at 30fps (frames per second). This meant that the TV displayed half the picture (called a "field") in one pass of the screen and the other half (another field) on the next pass. These half picture fields are displayed on the screen at a rate of 60 times per second (or 60Hz). This alternating pattern is constantly repeated and, therefore, results in a full picture 30 times a second (hence, 30fps). A CRT draws a picture line-by-line from left-to-right and then top-to-bottom. The fields are drawn in such a way where the odd-numbered lines are drawn (evens are skipped), and once the bottom of the screen is reached it begins from the top again, but this time drawing the even-numbered lines (odds are now skipped). This process is repeated, and it's quick enough that our eyes don't notice the rapid flickering...to a certain extent. 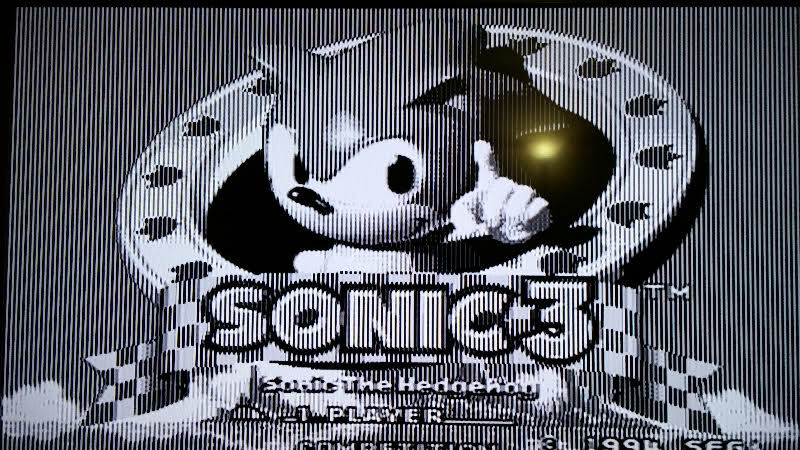 The lines are drawn in an alternating fashion and there's a special timing signal sent with the video content to tell the CRT to do this alternation. A full picture is considered to be consisting of about 480 lines, so we call this 480i (i = interlaced). However, the fluid motion desired in video games requires a faster framerate of 60fps. Older game consoles didn't have the technical capabilities of generating a full 480 line picture. The solution is to assume that a standard interlaced half picture (480 divided by 2 = 240) is a full picture, and simply display this picture at a normal field-rate of 60 times per second. This means that the other field and its entire set of lines are completely ignored. To accomplish this, the "special timing signal" mentioned above is slightly changed to tell the CRT to not alternate between its odd and even lines. Nintendo's name for this type of scanning is "double-strike", because the same set of lines are drawn twice within one scanning cycle while the lines that would normally be drawn in-between them are absent (or not "struck" at all). The more common term used for this type of signaling is "240p" (p = progressive). Another name for progressive is "non-interlaced". The input stages in some newer non-CRT TVs & monitors were not properly designed and do not accept 240p timing signals over the YPbPr component video connection (deemed "240p over component"). A very common example of "240p over component" is playing PlayStation 1 games on a PlayStation 2 which is hooked up with a PS2 YPbPr cable. This setup on a poorly designed TV can result in no picture on the display when the PlayStation 1 game launches. Therefore, those who seek to purchase our YPbPr cables should be aware that they may be incompatible with certain TV sets, and must be tested for compatibility prior to purchasing. An example of 240p incompatibility: PlayStation 1 game launching on a PlayStation 2 connected with YPbPr component cables. Even when HDTVs are capable of accepting a 240p component video signal, they might not process it correctly for display. This can result in visual artifacts appearing on the screen during rapid motion. As described above, 240p content is displayed at 60fps. Computer generated content, such as video games, utilize this capability to their fullest by rapidly changing sections of the screen every single frame, usually to convey a message to the player. A common example is your character "getting hit" or "taking damage". In many games, this causes your character to flash on and off rapidly at the 60fps rate. Every other frame, the even frames (arbitrarily in this example), are completely dropped so the object appears solid. The other set of frames, the odd frames, are completely dropped so the object has disappeared. The frames are merged and the object appears combed. The object is processed correctly. 1.) Flashing object appears solid. 3.) Flashing object is combed. 2.) Flashing object has disappeared. 4.) Flashing object is processed correctly. These are common issues with modern TVs in general, and they extend beyond just YPbPr component inputs. During our testing, in most cases when a TV incorrectly processes a 240p component signal, it also does so for the composite and s-video inputs. Like anything in the real world, there are exceptions to this. In fact, we have seen TVs where 240p component is processed correctly, while 240p composite is not. The reverse has also been witnessed. We'd like to make clear that there are issues with this type of technology and it can't be universally generalized. It's also possible that the above issues (when present) might not bother you or be noticeable to you at all. Everyone's mileage will vary. Our initial products, the SNES and Genesis YPbPr Component Cables, output the same signals the consoles generate, which are usually 240p signals of some form. The problems detailed above can all be easily resolved with an external video processor, but that would greatly increase the cost and make the solution less plug-and-play. We do have plans to create our own affordable video processor to eliminate these concerns completely. In a perfect world, this new product would be available at the same time as our cables, since they are intended to complement each other. In the meantime, we must succumb to reality. If you want to use our cables, you'll need to have a TV that supports "240p over component" or use a video processor that will. If 240p works with your TV but you get artifacts, then you might still want to invest in a video processor. We are video engineers after all, so we easily notice these artifacts and are bothered by them. However, most people, when we point out processing artifacts, either don't notice or don't care. We hope this explanation clears some things up about any possible issues with our SNES and Genesis YPbPr cables. Please contact us if you have any questions or concerns about this confusing topic. Also let us know if we missed anything or got something wrong. Here, we present our findings regarding equipment input compatibility for the "double-strike" 240p/288p signals generated by retro consoles like the Sega Genesis/Megadrive and Super Nintendo/Famicom. For all categories, an asterisk (*) and yellow highlighting indicate that the result is not clear-cut and you should read the notes/comments column for more detailed information. ***DISCLAIMER***: These lists are for reference ONLY. Everything below that was tested by us was with either a Sega Genesis 2 (VA1) or Sega Nomad as the source equipment. Since what is normally called "240p" is a non-standard type of signaling, different consoles (and console revisions) can output different versions of it. Therefore, the best way to know if our cables will work with your equipment is to perform the test we describe below on the exact console you intend to use. Other potential issues related to YPbPr inputs, such as sync jitter and color accuracy, are not necessarily addressed in these tests. 240p Compatibility Test - A pass means the television was able to display a 240p signal over its component video inputs. A fail means that the TV failed to properly detect a signal and will require a separate video processing box such as our future product, the HDMIzer. In the meantime, check out our list of compatible Video Processors below. 240p Processing Test - A pass means the television processed the signal correctly and we did not see strange artifacts (e.g. combing or completely missing/solid sprites when blinking). A fail means those artifacts were present in some form. For many people this is not an issue, thus failure of this test does not necessarily require an external video processor. Click here to view the television list, which is for reference only and mainly applies to the Genesis/Nomad with which they were tested. You should test each console you wish to use with our cables on your own equipment. 240p Test (YPbPr/CVBS) - A pass means the capture card was able to detect a valid 240p signal through its corresponding video input and send it to software for processing. A fail means that the card is unable to acquire a signal and will require a separate video processing box such as our future product, the HDMIzer. In the meantime, check out our list of compatible Video Processors below. Click here to view the capture card list, which is for reference only and mainly applies to the Genesis/Nomad with which they were tested. You should test each console you wish to use with our cables on your own equipment. 240p Compatibility Test - A pass means the processor was able to detect a 240p signal over its component video inputs and create a displayable image on its output(s). A fail means that the processor failed to properly detect a signal and/or displays a "mode not supported" message. 240p Processing Test - A pass means the processor converted the signal correctly and we did not see strange artifacts (e.g. combing or completely missing/solid sprites when blinking) on its output(s). A fail means those artifacts were present in some form. This may or may not be an issue for you, depending on your personal sensitivity to such artifacts. Click here to view the video processor list, which is for reference only and mainly applies to the Genesis/Nomad with which they were tested. You should test each console you wish to use with our cables on your own equipment. Although connecting a PlayStation 2 via component video and launching a PlayStation 1 game is the most common method people use to see if their TV or other video input devices accepts 240p YPbPr component video, please do not rely on it! There is a much more accurate (and simpler) method. All that is required is the retro console you plan to use our YPbPr cable with, its corresponding composite video cable, and a game cartridge to run on it. Depending on how your device's input jacks are laid out, there may be a couple of things you have to do differently. Because of this, you might also need an extra A/V cable with at least 2 RCA plugs. 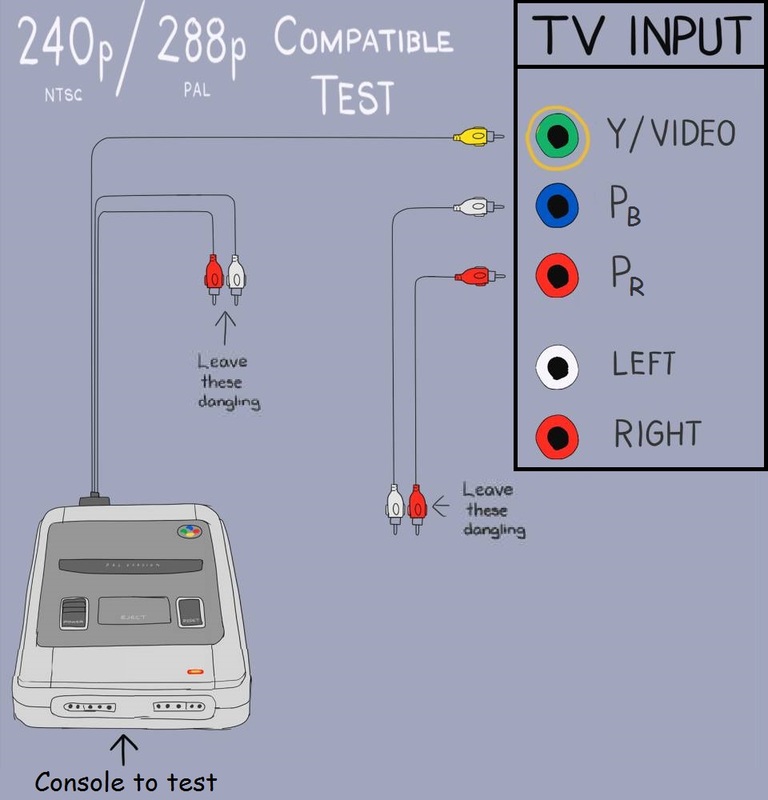 Repeat this test for ALL consoles you are planning to use our YPbPr cables with, as 240p is not standardized and some equipment will accept signals from one console but reject another. This includes testing add-ons such as the dbGrafx Booster for PC Engine and TurboGrafx-16 consoles. NOTE: Before beginning the test, please verify that your console and game work properly. We have witnessed false failures like this where the user wrongfully blamed the TV/display device instead of the console equipment. IMPORTANT: Some TVs, particularly many new Vizios, cannot be properly tested. IF YOU GET A COLOR IMAGE INSTEAD OF A BLACK & WHITE IMAGE ON YOUR TV, YOU HAVE NOT PROPERLY CHECKED 240P COMPATIBILITY. Please contact us if you have any issues related to this. Note to PANASONIC TV owners: Please take special note of the top half of the screen during testing. If it appears to be processed differently than the bottom half, this same artifact/effect will also appear when using our cables. Note to VIZIO & SONY TV owners: We have noticed a trend where many of these TVs can work with Genesis but NOT with SNES. This is why we advise you test each console separately. As of right now, we have not found a single Vizio TV that works with SNES. IMPORTANT NOTE: If your TV/device has 3.5mm (headphone-style) video ports, now is the time to plug in the respective RCA breakout adapters for all of these ports. See photo in the margin. Connect the composite video (yellow) cord from your retro console into the Y (green) jack of the component video set on your TV or device. Connect two extra RCAs cables (color doesn't matter) into the Pb (blue) and Pr (red) jacks next to this Y jack. Make sure the other end of these two cables remain disconnected. We advise against using the RCA audio cables (red & white) attached to the yellow composite cable you just plugged in. Please use a completely separate set of cables for this step. Select the corresponding input on your TV/device. For example, if you plugged the cable into the jack labeled Component 2, then select Component 2 on your device's input menu. Insert a game and turn on your retro console. Do not use Sonic the Hedgehog 2 for Genesis or Radical Psycho Machine Racing (RPM Racing) for SNES, as you might get invalid test results when using those games. Verify that a picture is displayed indicating that your game is running. The picture should be stable (not jumping around or flashing on/off) and in black&white with some distortions where color should be (example here). A stable black&white image, with fluid game motion, indicates that your TV/device is compatible. If proper 240p processing is important to you, now is the time to check if rapid motion and/or flashing game objects are being displayed properly as described above. Instead, if you see a message that says "No Signal", "Unsupported Signal Format", or "Mode Not Supported" then your TV/device doesn't accept 240p on its component video inputs. You'll need a separate processing box or a different TV/device. Rear of TV with separate component video and composite video inputs. Connect the composite video (yellow) cord from your retro console into the Y/Video jack on the TV or device. This shared jack is usually colored green, but sometimes it's half-green/half-yellow or it's green with a yellow halo on the plastic behind it. Connect two extra RCAs cables (color doesn't matter) into the Pb (blue) and Pr (red) jacks next to this Y/Video jack. Make sure the other end of these two cables remain disconnected. We advise against using the RCA audio cables (red & white) attached to the yellow composite cable you just plugged in. Please use a completely separate set of cables for this step. Select the corresponding input on your TV/device. 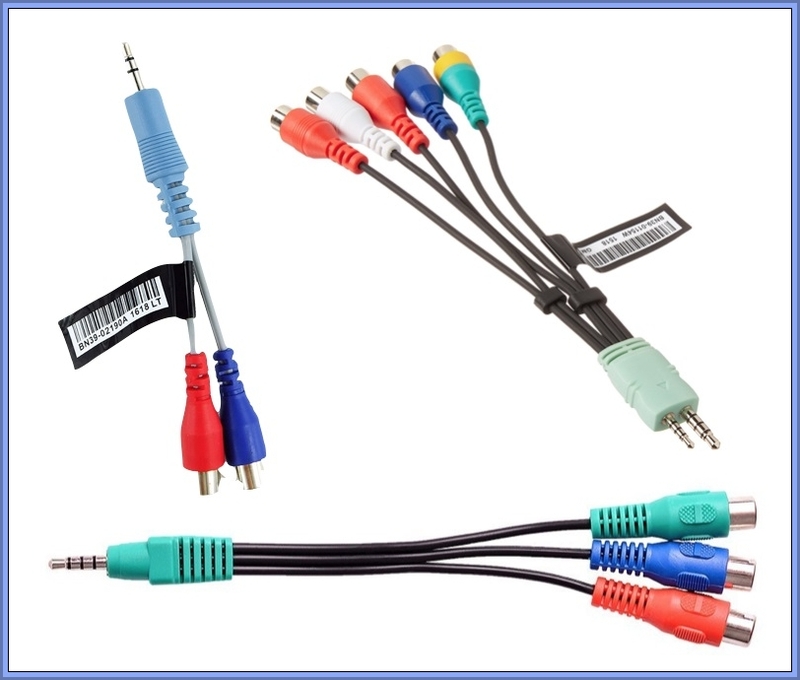 On some TVs/devices, it is vital that you plug the connectors in prior to selecting the desired input. These TVs/devices with shared jacks usually have three different ways of determining which type of signal to use on the jack. Auto-detection: Only having the Y/Video jack connected has the TV/device assume that composite video is plugged into the shared jack. Plugging in additional RCA cables (into Pb & Pr) trips a switch in the jacks that indicates to the TV/device to use component video. Either the TV/device will unlock the option for you to change to the correct video input, or when you select your shared input (ex. "AV 2 / Component 2") it knows which to pick. Separate Input Entries: When selecting your input, there will be two separate entries for the shared jack. For example, Component 2 and A/V 2 will be listed separately even though they refer to the same jack. Setup Menu Setting: On some TVs/devices (like many Toshiba TVs), you're required to go into the setup menu to change what type of signal the device should accept over the shared port(s). You must change this menu setting every time you switch between component and composite on the shared jack. Verify that a picture is displayed indicating that your game is running. The picture should be stable (not jumping around or flashing on/off) and in black&white with some distortions where color should be (example here). A stable black&white image, with fluid game motion, indicates that your TV/device is compatible. If proper 240p processing is important to you, now is the time to check if rapid motion and/or flashing game objects are being displayed properly as described above. Instead, if you receive a color picture instead of black & white, then please re-check the above process and then contact us for support if you still have issues. If you see a message that says "No Signal", "Unsupported Signal Format", or "Mode Not Supported" then your TV/device doesn't accept 240p on its component video inputs. You'll need a separate processing box or a different TV/device. Two different TVs having shared composite & component video inputs. Please contact us if you have any questions or if something in the test isn't clear.